The undersigned organizations welcome the introduction of the Women’s Entrepreneurship and Economic Empowerment Act of 2018 (HR.5480), a bipartisan bill that prioritizes women’s economic empowerment and highlights the financial tools, resources, and rights necessary for women to advance. This legislation, introduced by Congressman Ed Royce (R-CA), Congresswomen Lois Frankel (DFL), Congressman Eliot Engel (D-NY), Congressman Brian Fitzpatrick (R-PA), Congresswoman Ann Wagner (R-MO), and Congresswoman Robin Kelly (D-IL), improves USAID programs and activities focused on women’s entrepreneurship and economic empowerment globally. By highlighting critical barriers to women’s economic empowerment, the bill brings attention and government resources to the advancement of women as they start and grow businesses, expand their earnings and savings, and bring greater prosperity to themselves, their households, and their communities. This bill strengthens the work of USAID to support women’s empowerment in accessing and controlling resources such as property and land, while emphasizing the critical need to build women’s leadership skills, link them to credit and other financial resources, and address key structural issues such as discriminatory legal frameworks and access to legally enshrined rights, the burden of unpaid care work, and norms that have held women back. By focusing on approaches, including savings groups and financial literacy training, that link women living in extreme poverty to economic opportunities, the bill encourages USAID to leave no woman behind. While the bill brings attention to the needs of women as they seek to break the cycle of poverty, our organizations encourage the U.S. Government to take steps to ensure that all women can grasp economic opportunities through increased agency and decision-making power. Designing approaches that address critical impediments to women’s economic empowerment such as work place discrimination, unpaid care burdens disproportionately borne by women, or gender-based violence in homes and workplaces will make U.S. development assistance more effective and sustainable. Similarly, investing in women’s empowerment and equality across a variety of sectors – health, education, and political participation – fosters their ability to lift their voices and make positive changes for themselves and their communities. Creating the enabling environment for women’s economic empowerment also requires efforts to transform social norms and structural barriers that constrain women. 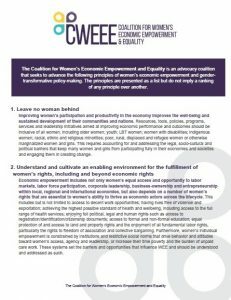 This is an approach consistent with the Coalition for Women’s Economic Empowerment and Equality’s ten principles of women’s economic empowerment. The Women’s Entrepreneurship and Economic Empowerment Act of 2018 is a positive step in building U.S. support for women’s economic empowerment globally. We urge Congress and the Administration to use this legislation to help strengthen their commitment to women everywhere to realize their rights and access opportunities for development and prosperity.